The idea makes sense, when you think about it. With crazy work schedules making it harder for people to take time out of the office for a true non-working vacation, the work-cation offers the best of both worlds, in a way. Employees get some time out of the office (usually somewhere fun), while employers still know that some work is getting done. Most companies that sanction work-cations add these “days out” in addition to true “days off” or vacation time, which means workers aren’t losing their vacation time by taking a work-cation. CNN reports that work-cations are becoming increasingly common, particularly in industries where remote work is encouraged. Employers in fields like tech, digital media, and even finance are starting to incorporate the work-cation as a way to refresh their workforce without falling behind on client deliverables. 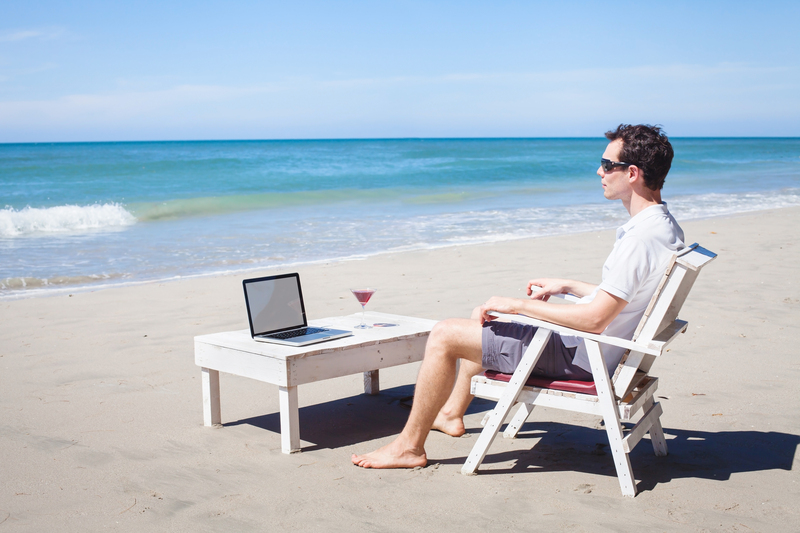 The work-cation also becomes more appealing to workers and companies alike when an office productivity platform is employed, since the right mobile office suite can arm work-cationing employees with everything they need to get the job done—and if they’re sipping umbrella drinks by poolside while doing it, no one is the wiser. Share with coworkers while relaxing in the countryside. A perfect work-cation means logging in remotely (at least part of your trip) from a vacation destination. If you’re an urban dweller, it can be sheer bliss to transport yourself to the countryside for a few days, and with laptop and smartphone in tow, you can easily stay connected to your colleagues using apps and cloud collaboration tools [ADD LINK TO “THE PRODUCTIVITY BENEFITS OF USING BUILT-IN CLOUD STORAGE] from WPS Office. The platform allows you to connect to cloud storage services like Dropbox, Box, and Google Drive, which makes sharing with coworkers a virtual snap—literally. As you sit out on the porch of a country cabin sipping lemonade, you can create files and then save them to your cloud of choice, allowing your colleagues to easily access and respond to them. Visit friends out of town while completing a draft report. The Writer app offers collaboration tools that make it easy to work in tandem with other WPS Office users, as well as MS Office users. Knowing this, you might propose to your boss that you schedule some work time out of the office while visiting friends in another locale. You can catch up with your pals during the day and then at night get some work done, using the Track Changes tool to add edits and comments to files shared by your colleagues. Spend a week at the beach while using collaboration software. Don’t have time for a two-week vacation disconnecting from the office? Then try the next best thing: a beachfront work-cation. The collaboration tools from WPS Office apply to the Presentation and Spreadsheets apps as well as Writer, which means there’s nothing you can’t do at the beach as long as you have a mobile device and Internet connection. Chime in on a PowerPoint for your team, or bang out on second-quarter budgeting figures in Excel, and let your colleagues chime in with feedback and comments—all with your toes in the sand. Participate in a fun run at an exotic location in the morning, and access shared files in the afternoon. If work hard, play hard is your mantra, you can do double duty on your work-cation by registering for a fitness event at a premier destination. Whether you want to try a 5K race in Las Vegas or train for a half-marathon somewhere warm and tropical, choosing an achievable athletic endeavor can give you a framework for your work-cation and help you get fitter too. While celebrating your finish over a post-race beer, you can access that spreadsheet from your colleagues and share it with the team via WPS Office. Your boss just might forget that you’re out of the office! As you can see, there’s no shortage of things you can do on your work-cation—and thanks to office productivity platforms, there’s no reason why you can’t do it all and then some.